Turn cucumbers into this refreshing flavor combination. Holly Clegg gives us a sneak peak at one of the best summer recipes from her new book, out early this fall, KITCHEN 101: Secrets to Cooking Confidence! 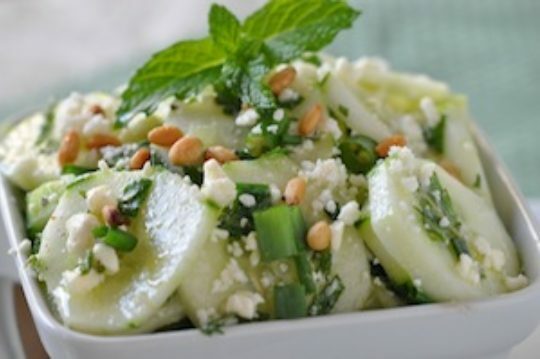 The delightfully crisp Cucumber, Mint and Feta Salad, from the ‘Ready-Made Menus – Summer Sensations’ chapter, has become a standout with her family, and even better the mint is straight from her garden so you know it is easy! Terrific Tip: This is one time fresh mint makes a difference. Pine nuts are pricey so if you don’t want to use them, just leave them out.